Ninja’s needed to have an excellent ability to memorize. Important information which ninjas aimed to get were not necessarily written on documents. Everything that ninjas saw and heard needed to be committed to memory. It was not just limited to when ninjas stole hostile information or when they received directions from their lords or any other obviously important situation, they never failed to listen well and commit things to memory. 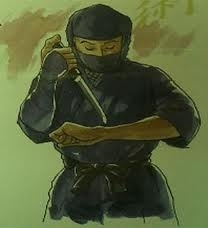 Ninjas were always on high alert and had their minds well trained to listen well and interpret all situations clearly. All ninjas needed a perfect memory. For that reason, ninjas worked hard on developing methods of memorizing facts. It is thought that they usually trained very hard to learn things by heart and memorize information well. In the case where a ninja stayed for a long time in the attic of a hostile residence, they could not write information that they heard on a piece of paper because of the darkness. Ninjas had to memorize what they heard correctly right then and there. So what did ninjas do? They associated body parts with numbers like below. 1-head, 2-forehead, 3-eye, 4-nose, 5-mouth, 6-throat, 7-chest, 8-body, 9-hip, 10-leg. This method was able to be used not only with just combinations of numbers but also for words like body parts, so long as the words and number configurations were set in advance, it could be used by anyone. Such methods were used with foods too. 1-Taro (いも imo) , 2-boiled plum (煮梅 niume) , 3-Japanese pepper (山椒 sansho) , 4-shiitake mushroom (椎茸 shitake) , 5-burdock (ごぼう gobo) . The first sound in each food above is a number (when the Japanese equivalents of each are used) and this is why these numbers were associated with these foods. In Japanese, 1 - 5 are written as below. 1-ichi, 2-ni, 3-san, 4-shi, 5-go. In this way, ninjas could memorize through associating items with numbers. Further still, there was an even more advanced method of memorization. Ninjas used the joints of the body too. This method allowed for the use of a lot of names and concepts because we have around 300 joints on our bodies. using this method required ninjas to memorize a large amount of information. By the way, do you have any scars on your body? If so, you probably still remember when you got them. Because pain and memory are connected so closely ninjas utilized even pain and scars. Sometimes they hurt themselves on purpose with a blade while they were trying to memorize important secret information. Because of this, ninjas could bring up relevant memories whenever they looked at the scars on their bodies. This was called " Fubo-no-Jutsu (不忘の術) " in Japanese. It means " the technique of never forgetting ". For ninjas, even hurting themselves was acceptable if it made them more professional and effective on missions. Ninjas also made use of their scars as follows. Before their mission, they would crop their hair and prepare for the mission by reviewing what they knew about the enemy. When they got their objective information, they would write down the contents on their heads directly with a blade. After that, they would wait for their hair to grow enough to conceal the characters on their heads. If they could get enough hair on their heads for the message to not be noticed then they would go back to their homes. After that, they would shave their hair completely again to reveal the secrets on their heads. Needless to say, it is better for ninjas and their lords to bring the secrets in writing rather than by hurting their bodies. Of course, ninjas had specific techniques for carrying the characters written on something. Let’s have a look at them. This method is called " Inbun-Hitoku-no-Ho (隠文秘匿之法) ". At first, a ninja would prepare a pole with a length of about 300 mm and a thin paper roll with a width of about 10 mm. Secondly, he would roll the paper around it tightly. In order to keep it hidden, it was imperative that the rolled up paper wasn’t broken and also that the paper overlapped the pole. If it was completed, a ninja would write secrets on the paper with a brush pen. If finished, he would take off the paper rolled around the stick. Herewith, no one could understand what was written on the paper if they saw it. This was the completion of what could be used as a confidential letter. In advance, a ninja and his comrades had to keep the poles with a similar thickness to the ninja. Another ninja could read the words on the paper by means of rolling the paper on the pole again. The next problem was bringing information somewhere. Ninjas had to pass checkpoints without having their confidential documents found on them. If suspicious writings were found on them, they would of course open themselves up to dangerous situations and allow for someone to potentially read the documents. So, what did the ninjas do? 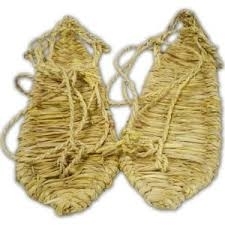 They had made the paper into a string and weaved it into their " Amigasa (編み笠) ", which was a Japanese ancient straw hat for travelers, or into their" Waraji (草鞋) ", which were Japanese straw sandals. Such details as the seams of amigasa or waraji would not be checked which meant that ninjas could pass through unsuspected. Ninjas were able to leave hostile places with important information like this.